The kindness you spread, keep returning to you. 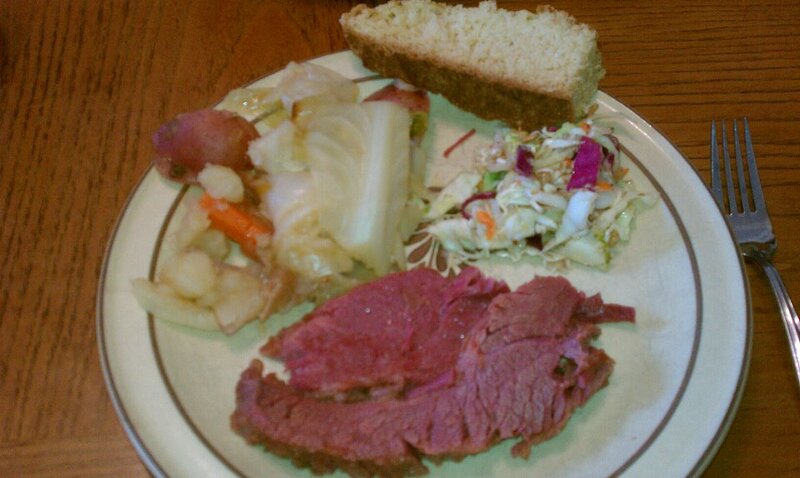 Perhaps it’s the Bryan in me, but I love Corned Beef and Cabbage. LOVE. When Corned Beef goes on sale around St. Patrick’s day, I stock up for the rest of the year. I could eat cooked cabbage all day, although I’m sure those around me are glad I don’t. Fried cabbage and onions are to die for. St. Patrick’s Day is better than Thanksgiving as far as I’m concerned. It’s the one day a year I do a full-on Irish meal. My son likes to rate his meals on an all-time favorite scale. I told him today I would have to rate Corned Beef and Cabbage as a 9 on a 1 to 10 meal scale. Normally I cook my corned beef in a slow cooker. Throw in a bottle of Irish lager for the liquid, a few extra spices, cook for eight hours and the beef comes out so tender it falls apart. Obviously that’s an all-day deal though, and I really wanted to try my pressure cooker on corned beef this year. Pressure cooking is sort of a mystery to me. I actually only own a pressure cooker because I saw one on a clearance rack at KMart several years ago for 10 bucks and couldn’t stop myself from buying it. It sat in my cupboard for several years, just because I was half afraid of the thing. Eventually I lost the manual to it. Last summer I tried to sell it in a garage sale for $5, but nobody would buy it. I had a couple of men looking it over very closely — examining the rubber seal for signs of wear and tear, turning it this way and that looking for scrapes or dents, discussing it in depth with one another. It was, at that moment, brand new and completely unused, which if English had been their native language, they might have understood. In the end, they left the cooker sitting on the table and moved on to the next garage sale with their 25¢ t-shirts. 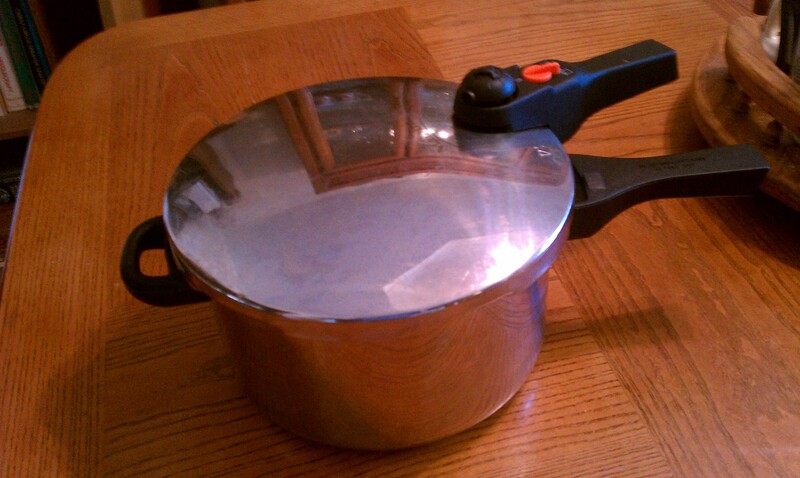 I took the non-sale of a brand new pressure cooker for cheapsters as a sign that I needed to be using the thing. After contacting the manufacturer by email, and with manual in hand, I felt better about giving the cooker a try. Turns out the manual really doesn’t do much but tell you how to keep it from exploding anyway. My first experiment was with beans. I think I tried to make navy bean soup. I invented bean glue. It was ugly, brown and lumpy. And it smelled funny. I put the cooker away again for another few months to gather dust. But I had to try it again. For my second try, I opted for a pot roast. Success! It took a naturally tough piece of arm roast and turned it into a tender, moist, tasty pot roast with some awesome drippings for au jus or gravy. Once I understood the whole “hissing” and how to gauge how much hissing was good and how much hissing was too much, I was a pot roast cooking fool. We had pot roast on a regular basis, as long as the the roast was on sale, and round steak in gravy, another notoriously cheap, but tough cut of meat. I may try pinto beans one day, but for now, I can do the large chunks of meat, and that’s working for me. So this is my first corned beef in a pressure cooker. 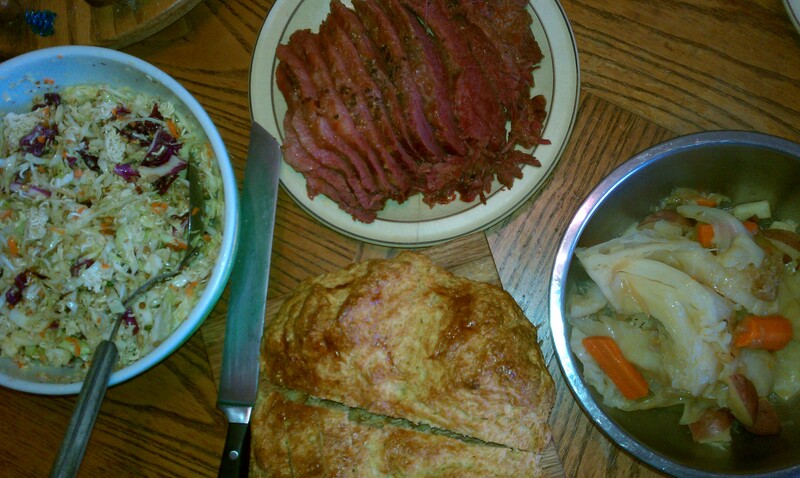 I had my entire St. Patrick’s Day dinner ready in about two hours flat, including the time it took for the cooker to come to pressure and depressurize twice. Lessons learned: use plenty of liquid in your pressure cooker, but don’t overfill it. As the cooker is cooking, steam will be escaping through the value on top, and if you don’t have enough liquid, you’ll burn your food dry. Not a good thing. Learn to listen and gauge the hissing. Screaming is not good. A nice steady hiss with a steady stream of steam is perfect, and once you’ve brought your cooker up to pressure, reduce the heat to keep the hissing at a nice even tone. If the hissing suddenly stops, you’ve likely used up all your liquid, so take it off the heat pronto, depressurize and check. Cook in the order of longest to shortest cooking time, and don’t be afraid to reuse the drippings from the meat to cook your veggies in. Even the hardest root vegetables like carrots cook in mere minutes, so save veggies for last. Depressurizing is easy, just be patient if you’re using the natural method. The cold water method works very well, and very fast. 5.14.12 Edit: If you’re browning meat before you pressure cook it, brown it in a separate pan, or be sure you thoroughly de-glaze the bottom of your pressure cooker if you brown it in it. I didn’t de-glaze my pressure cooker well enough when I made a round steak meal, and the bits on the bottom burned. The meat and sauce were absolutely perfectly cooked, but inedible because the entire dish tasted like a piece of charcoal. For today’s meal, I bought the cheaper, point cut, Corned Beef, on sale for $1.67 a pound. You don’t need to spend the money on the tip cut, because the pressure cooker will tenderize shoe leather. I bought a 4 pound cut, for a whopping $7. Add in medium-sized head of cabbage on sale for 17¢ a pound, and a five pound bag of red potatoes on sale for $1.47. The entire meal cost less than $10 with tax. Score! Put your onions and garlic in the pot and put your corned beef, fat side up, on top of the veggies. Spread the spice packet over the top of the beef, throw in the bay leaves, and add your beef broth until it comes up about 3/4ths of the way up the sides of the beef. Pop on the lid and lock it, and put over high heat until it starts to hiss at a steady rate. Reduce your heat just to the point that the hissing continues without stopping. (Alternatively, follow the directions in your cooker manual on how to bring it up to pressure.) Cook for 1 hour. Remove from heat and depressurize. I let my beef depressurize naturally so it continued to cook another few minutes. While your beef is cooking, prepare your veggies and set aside in a bowl. When your beef is done, remove it from the cooker, plate it, cover with foil and set aside to rest. Dump your veggies into the remaining broth, add more water to bring the liquid up to just below the top of the veggies. Lock on the lid and bring to pressure over high heat. Reduce the heat and cook for 5 to 6 minutes — no more or you’ll have vegetable mush. Remove from heat and depressurize. I used the water method this time, so the cooking would stop quickly. 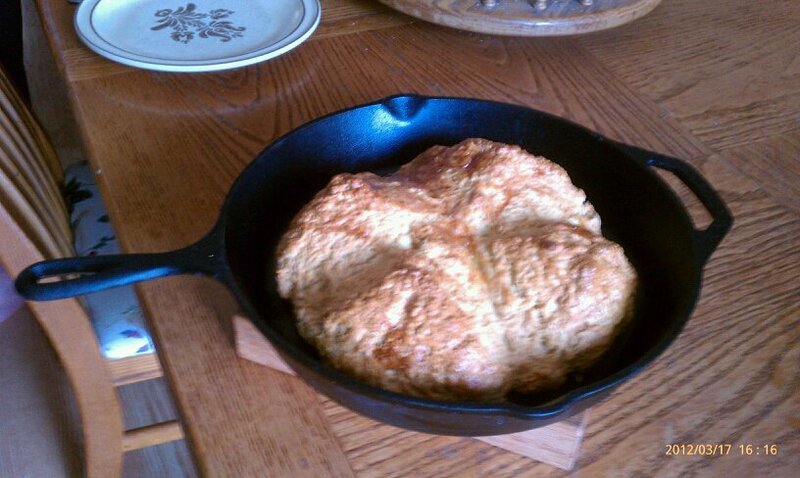 I also served White Irish Soda Bread this St. Patrick’s Day. This simple, unleavened loaf could almost be compared to cornbread, but it is not as grainy and is slightly sweet. Because there is no yeast, it comes together very quickly and can be baking while your corned beef is pressure cooking. Preheat oven to 375. I baked mine in a large cast iron skillet in the oven, otherwise, lightly grease a large baking sheet. Mix together all the dry ingredients, the margarine, buttermilk and egg. The dough is slightly crumbly. Lightly flour your counter and turn the dough out into a round and knead just until it forms an actual dough ball. Put the dough onto the baking sheet or in the skillet, and brush lightly with an egg wash. Take a sharp knife and cut an X into the top of the loaf (this is so the thickest part of the loaf bakes through). Bake for 45 to 50 minutes until a toothpick or cake tester comes out clean. Serve with butter or honey butter. This year I had also made an Asian Ramen salad to go with the meal, because our 10yo is not at all adventurous when it comes to new foods and she’d never had Corned Beef before. I knew she’d eat the Ramen salad, which although it was very good, was completely unnecessary because she loved the corned beef. Tomorrow we have Rubens!